Walnut Street is a central artery in Philadelphia, as it has been since before our parents’ parents’ parents were born. 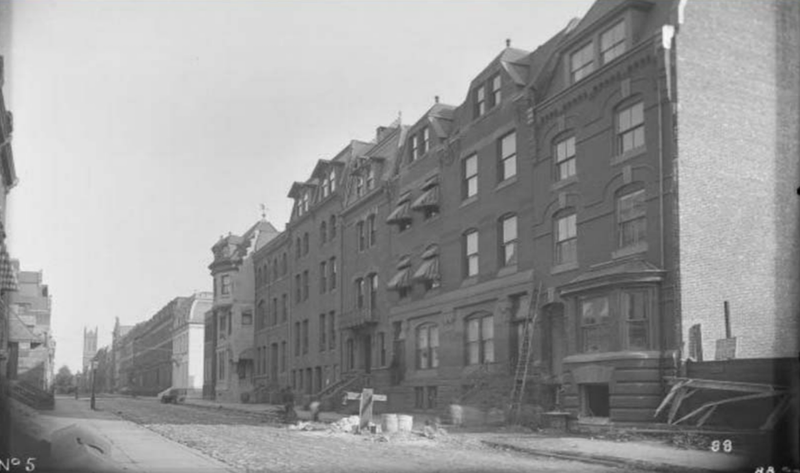 It was around that time, now that we think about it, that numerous mansions sprung up along Walnut Street, providing wealthy Philadelphia families with well-located and handsomely designed abodes. Some of those buildings have survived the last century plus, while others have unfortunately been lost forever. Others are still around, but their facades have been modified to the point of being unrecognizable. We believe that most of the buildings in the photo above are still around, but only a couple look mostly like they did back in the 1800s. A notable departure from the past is 2216 Walnut St., the home on the far right in the image. The home was built right around the time that the image was captured and was designed in the Second Empire style by the famed Furness, Evans and Company. It was initially used as a home for the Livingston family, but it served as a rental within a couple years, and changed hands a couple times in the ensuing decades. In 1950, Monroe Calculating Machine Company purchased the property and converted it to commercial use. This not only entailed an interior renovation, but also resulted in a new and objectively worse midcentury modern facade. Moore College of Art took over the building in later years, and it eventually got combined with the adjacent Roosevelt Hotel building. In recent years, you may remember an Italian Restaurant on the first floor, but the retail space is currently vacant. You may notice in the image above that there’s a notice posted to the building, announcing its demolition. We should be more specific- the owners of the property are planning to tear down the existing building, but will maintain its facade. 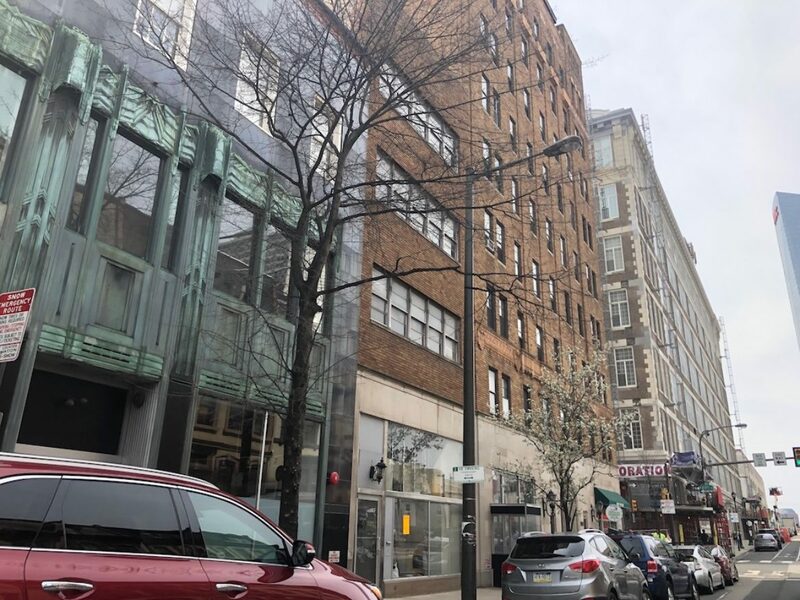 In order to proceed with the project, the developers had to go before the Historical Commission to get the building removed as a contributing structure within the Rittenhouse / Fitler Historic District. The history of the building which we provided was cribbed from the application for this removal, which was ultimately approved. The developers went back to Historic at the end of last year to seek permission to add a couple of stories to the existing building and create 12 rental apartments on the upper floors, above a retail space. 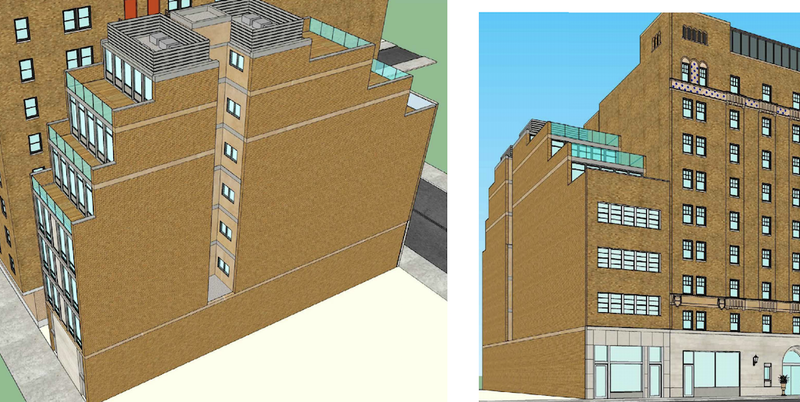 Here are some renderings, from SgRA Architecture. With a different building, this would be a nice way to preserve the existing facade and its appearance on the street while expanding its square footage upward. For this building though, we’re a bit confused as to why the developers are maintaining the existing mid century modern facade and using step backs to preserve the views. We have to think that this was desired by the neighborhood or the Historical Commission, but why would anyone want to keep this facade, which looks like a high school in the suburbs? We’d have rather seen a brand new building over the preservation of this facade for what will likely be another hundred years. What would you prefer? No real mystery. The Preservation Alliance holds a preservation easement on the combined facades of both that building and the Roosevelt next door, meaning that a previous owner agreed to donate a preservation easement in exchange for tax benefits. After seeing the recent new construction on the 2100 block of Walnut, no, I would NOT rather see a brand new building! At least we know what we’ve got here. This is not stellar architecture but looks fine and cohesive with the Roosevelt building next door. Agreed, that facade is terrible. I’m fine with it staying. Sure, it’s boring but it’s unlikely that what would replace it would be any nicer. Nobody’s going to care what it looks like….As long as the money-machine keeps rolling. Pity about the forever vacant first floor though.